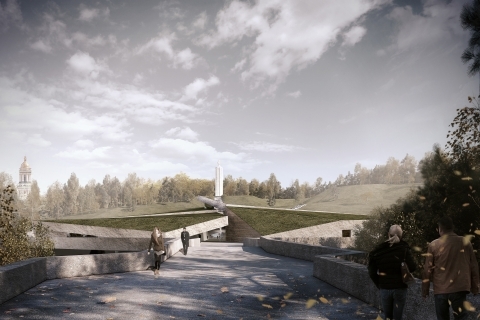 The starting point for the design of the Memorial building is the concept of blending it into the tectonics and landscape of the Dnieper valley slope, near Pechersk Lavra, a place of unique importance in the history of Ukraine. 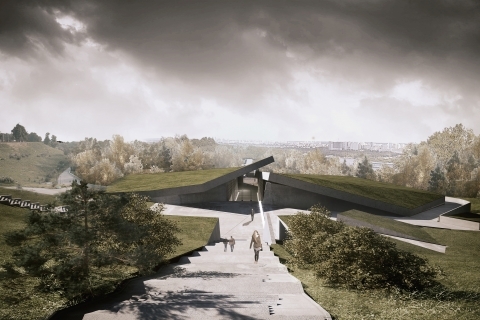 The Museum building is located on the axis leading from the viewpoint to the existing candle-shaped monument commemorating the victims of the Holodomor – the man-made famine in Ukraine in 1932-1933. 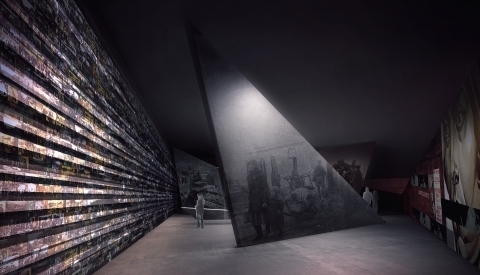 The architectural form of the building is an image of the idea of bringing to light the deliberately hidden truth about the Holodomor (Great Famine). The hidden history is to be remembered not only by the tectonic layers covering the building and the architectural intervention consisting in hiding the body of the building under the ground, but also by changing the colour of vegetation which will grow on the roof covered with soil. Also, the characteristic slitting of the roof of the building and the shifting of its half has a symbolic dimension – it shows how people’s actions lead to exposing and declassifying the crime. 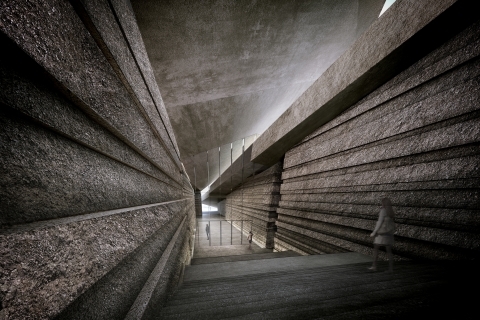 The monumental entrance to the building, located from the side of the candle-shaped monument, is a gate leading to the interior of the earth and to the hidden truth which will be shown in the exposition of the Memorial. 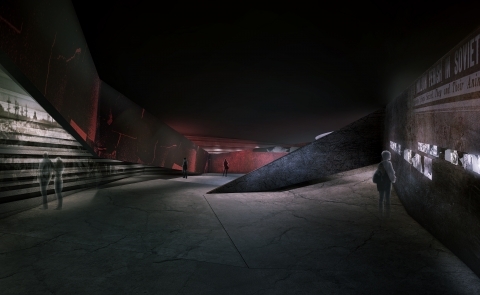 Through the set design and other artistic and architectural solutions, the authors intend to arouse emotions and make us reflect on the tragedy that took place in Ukraine. 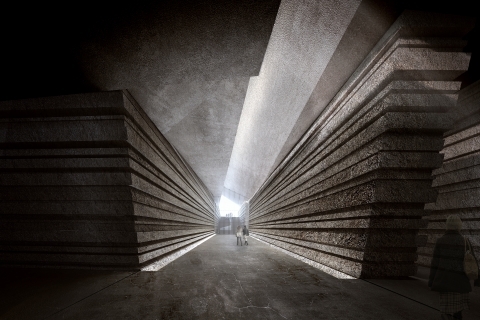 The exhibition design prepared by Mirosław Nizio’s studio assumes building a narrative that is made up of two parts. 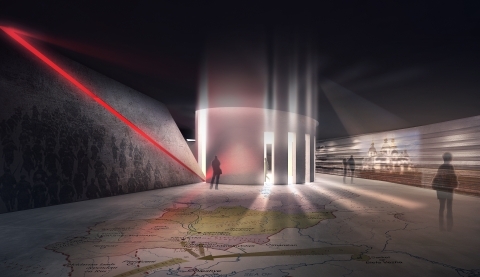 The architectural design of the Museum building has been prepared by Polish architectural studio Nizio Design International owned by Mirosław Nizio, in cooperation with the Ukrainian studio Project Systems LTD. Nizio Design International is fully responsible for the design of the permanent exhibition of the Memorial. 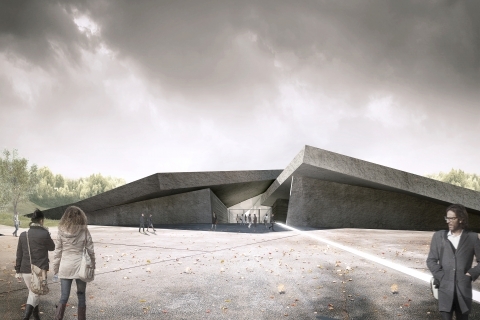 Works on construction of the Museum will take several years. Total usable area of the Museum is almost 14,000 m2, while the exhibition area will occupy over 3,500 m2.